Before updating we strongly recommend you take a backup of your database. Tip When you are ready to use Invoice 360 for your company, please use the Settings -> Reset function to remove the demo data. 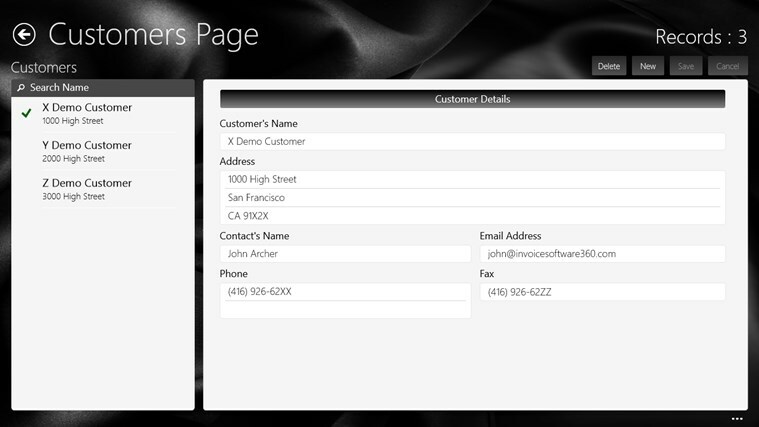 With the demo data removed, you can easily change the Company Name and Invoice Number. v2.92 Updates -PDF Bug Fixes for Adobe Acrobat Reader DC v2.9 Updates -Support up to 50 items per invoice. 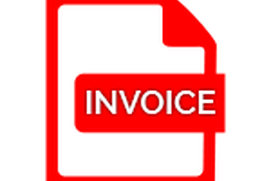 v2.8 Updates -Resolved the PDF error when an existing invoice PDF is overwritten. v2.7 Updates -Resolved the issue of the invoice/quote PDF not displaying properly for certain locale. v2.6 Updates -Support for Partially Paid and Fully Paid Invoice Search in History screen -Archival Support for Fully Paid Invoices -Duplicate Inventory Item -Indent Item Product Description -Improved User Interfaces -Bug Fixes v2.5 Updates -Support for multiple Line Breaks in Item Description. -Support for Actual Size PDF rendering. -Support for additional decimal point (up to 3) for Tax rate. Previous Updates -Support for Print Job submission/cancellation status. 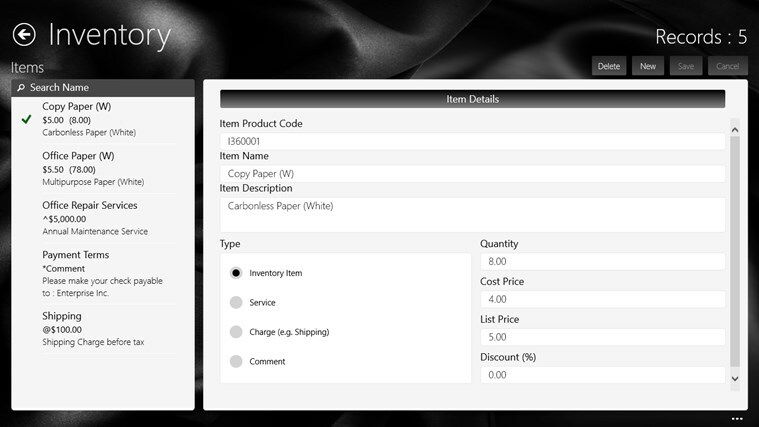 -Auto Paper Selection during printing based on the Invoice Template setup in the Settings screen. 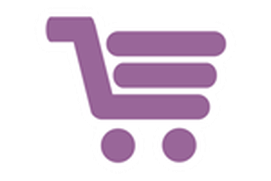 -Support for Multiple Payments. -Support for negative Number of Items in the Inventory screen. 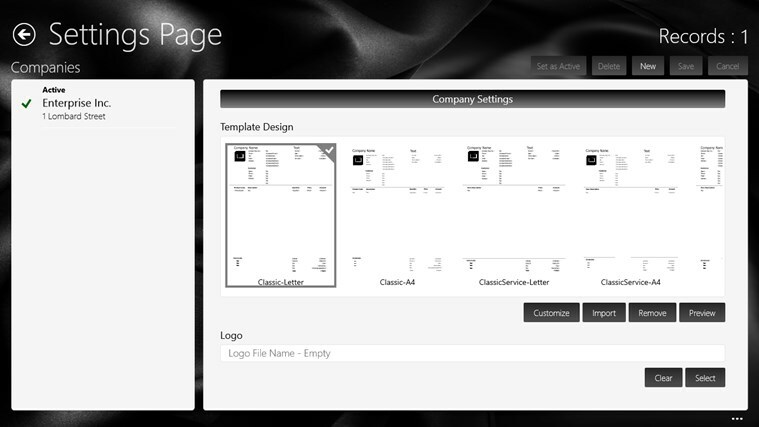 -Support for the display of Balance Due through the use of new Invoice Templates from our Invoice Templates gallery. 10 Killer Windows 8 Business Apps for Real Productivity! - ITWorld.com Great business apps that your business will benefit from. - Microsoft (Business Community) Go paperless or die trying! 15 tablets apps for ditching dead trees. - COMPUTERWORLD (IDG) Generate invoices for your clients using Windows RT or 8 Pros tablet interface with the freeware app Invoice360. - techrepublic.com 8 Best Windows 8 Business Apps to Increase Productivity! - the techBay 40 Killer Windows Store Apps for Microsoft Partners - Redmond Channel Partner The best 5 Windows apps for Businessmen - techivy.com 10 Laptop Apps That Improve Productivity - resourcenation.com Top 10 Business Apps For Maximizing Productivity On Your Surface Pro! - everythingsurface.org Best 5 Business Apps from Windows 8 for Profitability - iwebsoftsolution.com Essential Windows 8 Apps for Business! 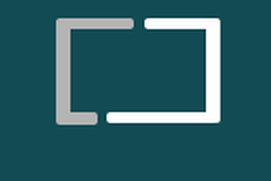 - anywhereworking.org 7 Great Windows Store Apps for Business Use. 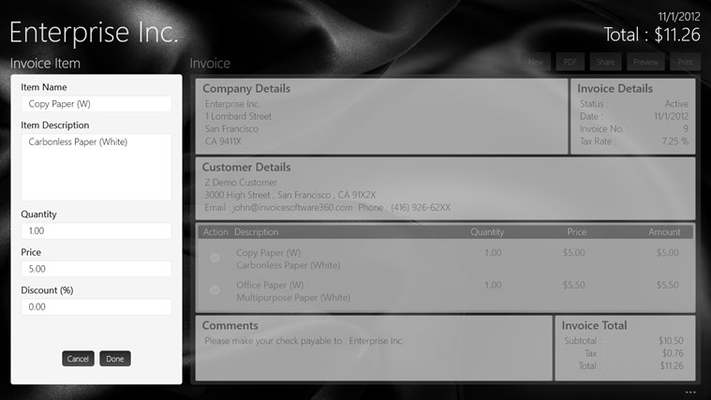 - windows8enterprise.com Invoice 360 is an e-invoice software and app designed for people on the go. 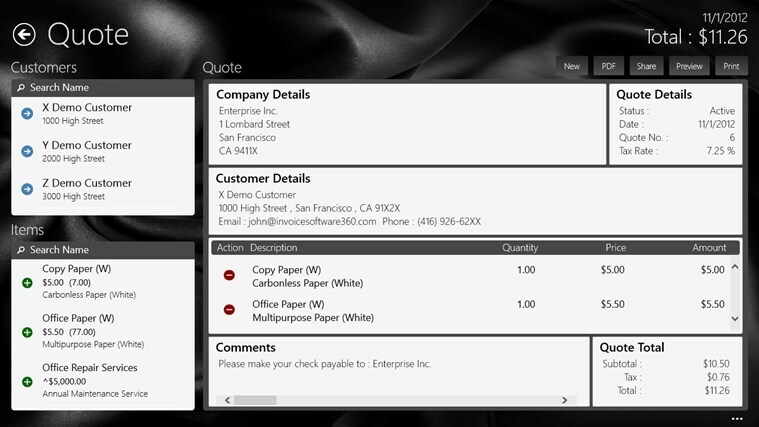 It is elegantly simple and easy to use while allowing you to create stunningly beautiful invoices quickly. Invoice 360 is a holistic end-to-end app that allows you to create company, customers, inventory items and invoices; to amend the invoices; to print to printers or PDF the invoices; to do invoice payments or to email a softcopy of the invoices to your customers. With a 360° view of your business information at your finger-tips, you can stay on top of things when dealing with your customers. Elegantly Simple We use the elegantly simple "Cards-and-Paper" metaphor to design our user interface. The "Cards" is on the left-hand side of the app to reference a list of customers, inventory items and pricing. You can reference the "Cards" to add inventory items onto the "Paper" (which is the invoice) on the right. This is a metaphor that most of us, who need to issue invoices, can understand, visualize and associate with. We gleaned this metaphor from previous experiences where we successfully helped fast-growing companies transform their on the go manual "Cards-and-Paper" invoice issuance to that of a fully automated one using our software. With this elegantly simple user interface, we hope to enable you create any invoice within 10 seconds. 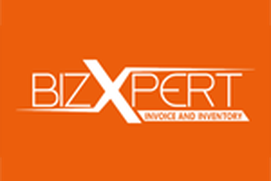 Professional invoice templates to choose from or customize! 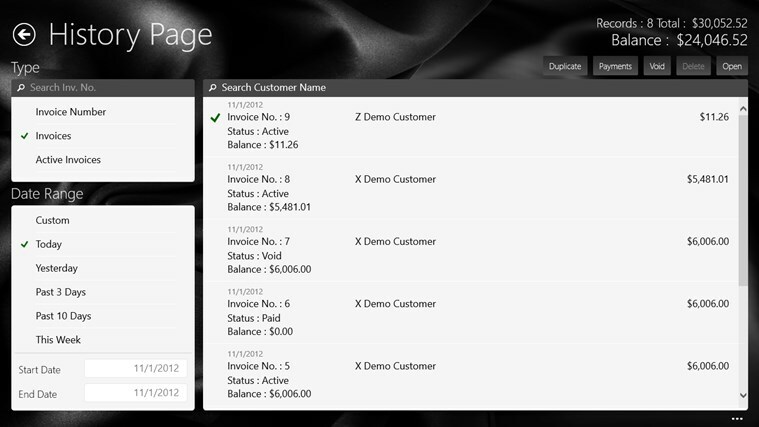 You can choose an invoice template that comes with Invoice 360 without the need to create one from scratch. This allows you to focus on what's important for your business, and not be bogged down by invoice design. You can also customize an existing invoice template to incorporate your existing business logo and layout using the Desktop Invoice 360 Template Designer. This designer has a WYSIWYG (What-you-see-is-what-you-get) user interface that is intuitive to use for anyone. PDF (Portable Document Format) Invoices For accounting purposes, many customers require an electronic copy of the invoice. The PDF format, being the most ubiquitous and flexible format, is selected as the document electronic format. We have chosen to build an in-app PDF engine that enables you to load new invoice templates and generate PDF invoices without additional third-party PDF printer drivers or plugins. Our Philosophy Have you thought about how many times you use or reuse your invoice app? Everyday, day after day, invoice after invoice and customer after customer. We definitely have. That is why we build this invoice app to be simple, elegant and in a way that is easy to use while on the go. We have also tested our app with different scenarios vigorously, so that you know you can be assured of its quality, robustness and reliability. We provide comprehensive documentations on the app so that you do not need to guess or figure out how we have designed and implemented it. Our app is designed in black and white color. 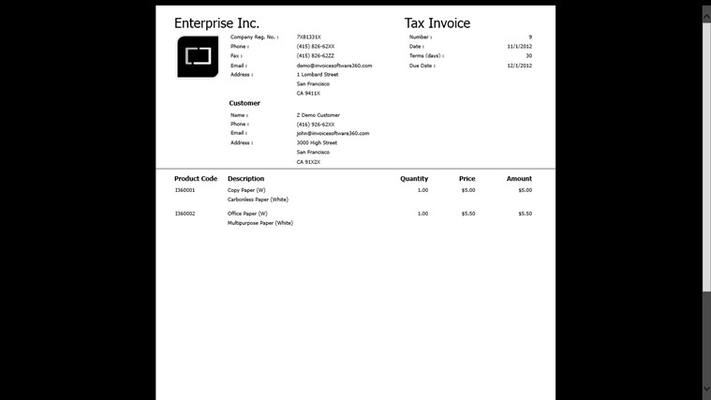 We believe this is how a professional invoice app should be - simple and elegant. We focus our design on function, not on fashion. Whether you are a business owner, manager, accountant, or business executive from a Fortune 500 company, or a free-lancer, a consultant or an entrepreneur joining the business world, we hope that you will find this invoice app useful as we have put together our best experience, invest our best effort and time to develop this invoice app. If you are updating from an existing version, we strongly recommend you take a backup of your database. Important Notes When you are ready to use Invoice 360 for your company, please use the Settings -> Reset function to remove the demo data. With the demo data removed, you can easily change the Company Name and Invoice Number. THANK YOU FOR YOU BUSSINES. This app at least provides an easy way to bring Outlook contacts into the app. Why no one actually integrates with Outlook I don't know but at least this one you don't have to do some tedious csv mapping. Major draw back is not being able to manually enter credits or discounts other than percentage discounts. Other wise it works. I want this to work 4 us. Help M help U. Connect or loose mass acceptance. I use this app every week,on my pc. I am a trainer and needed a invoice program that wasn't too difficult and fast. I find it easy to use once you get the hang of it. I would recommend you give it a try. Cannot get it to install on Windows 8. Review it with 1 star because I couldn't do anything less.